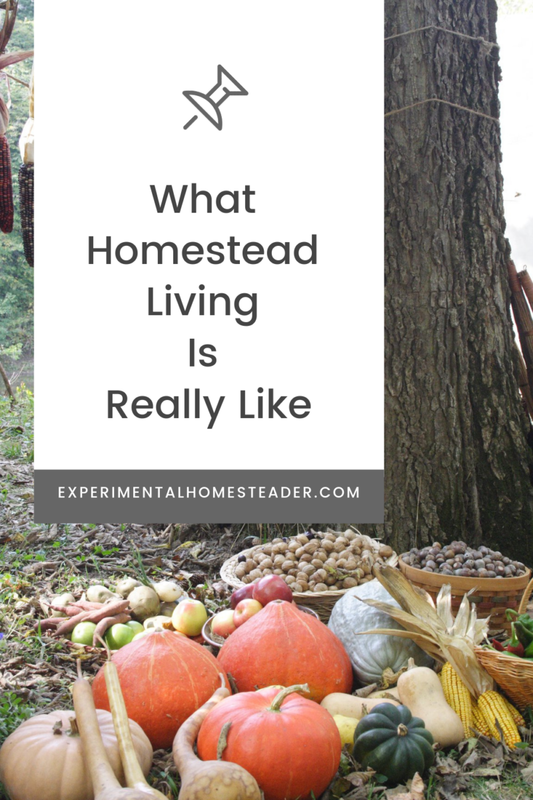 For those just thinking about homesteading or starting to take the first steps, the reality of homestead living is not romantic or even picturesque. 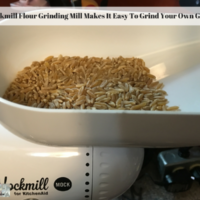 Living on a homestead and being successful at it requires dedication, hard work as well as skill because knowing how to do things is half the battle. 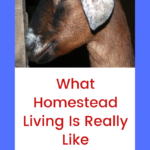 Of course living the homestead lifestyle is also rewarding and at times fun, such as when we attend the Mississinewa 1812 Festival or watch our baby goats jumping around outside. Nothing quite compares to watching chickens hatch or a goat kid being born. The welcome sounds the animals make when you approach is some of the most joyful sounds I have ever experienced. Growing your own food and knowing how it was raised, without question, is immensely satisfying. 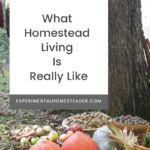 Everything mentioned above is the reality of homestead living, but it doesn’t end there. Many people who chose this lifestyle want to be self-sufficient and this is one of my goals. To me, knowing that I do not need to go to the grocery store is liberating. It is also much more satisfying to know that the money I make to pay my bills comes from the land I live on. Sometimes that money is made through the sale of food I grow, livestock, eggs, handmade crafts or foods I make such as bread or noodles. 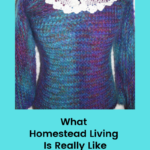 This is my reality of homestead living and it is not a lifestyle I would trade. 7am to 9am – Walk through the garden deadheading flowers, taking note of what is in bloom and harvesting the fruits, vegetables and herbs that are ready to be harvested. Then take the harvest inside the house, put it in the kitchen and gather the milking supplies. 9am to 10am – Let the chickens out of the chicken coop, then feed and water them. Give the livestock hay, fill the water troughs and give our horse grain. Bring each goat in milk out of the stall and put them on the milk stand. Let them eat their grain while they are being milked. 10am to 12noon – Pasteurize the milk. Go back to the chicken coop to collect the eggs and wash them if necessary. Bake bread, make cheese, make butter and make ice cream if necessary. 12noon to 1pm – Go back to the barn and chicken coop to clean stalls and rabbit cages if necessary. 1pm to 5pm – Put the harvest up. This could mean dehydrating, freezing or canning whatever was harvested from the garden that morning. 5pm to 6pm – Go back to the barn to pass out another round of hay and grain our horse. Bring each goat in milk out of the stall and milk them for the second time that day. Let them eat their evening grain while they are being milked. 6pm to 7pm – Pasteurize the milk. 7pm to 9pm – Go out to the garden to do any weeding, watering or other necessary maintenance. 9pm to 11pm – Put the chickens, goats, sheep and horse up for the night. Come back inside and start supper. 11pm to Midnight – Eat supper. Clean up the kitchen. Get ready for bed. While this schedule might seem really hectic, once you are on it you adjust. Of course, the schedule is going to look different for everyone. For example, I could get up earlier and get the livestock chores out of the way before I headed to the garden. The reason for waiting until later in the day to collect the harvest is the best time to gather herbs is right after the morning dew has dried. Also there have been times we have continued well into the night doing canning simply because the harvest was that large and we did not have any place to store the food. 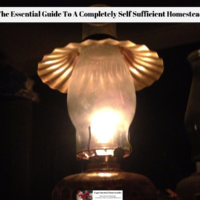 Once you are on your homestead, your schedule will take shape, so do not worry if it does not look exactly like mine, that is fine. You do what works for you! One of the homesteading projects I have been working on is a new sweater that I am knitting on one of my Kniffty Knitter Looms. Sweaters made of natural fibers are ideal for winter on the homestead because they keep you warmer than sweaters made of man-made fibers. The sweater I am making is made up of wool and mohair, some of which came from animals raised here on our homestead. Some of the yarn I chose was spun by hand and some was spun by machine. The yarn was a mix of browns and purples which are perfect colors for fall. I can’t wait to get the sweater finished and try it on! This is the second project I have made using the Kniffty Knitter Loom Set and by far the most complicated. My first project was a pair of thick wool socks that I just love. 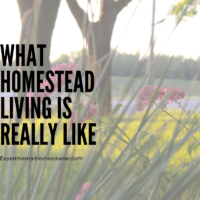 Of course, homestead living is about more than just working on your homestead. Here in Grant County, Indiana the 1812 re-enactment is a huge crowd drawer. Prior to this year I had never attended, nor had I thought of how a reenactment might relate to homestead living. However my daughter came home with an assignment from her photography class to go, so that was one of the many things on the weekend agenda. 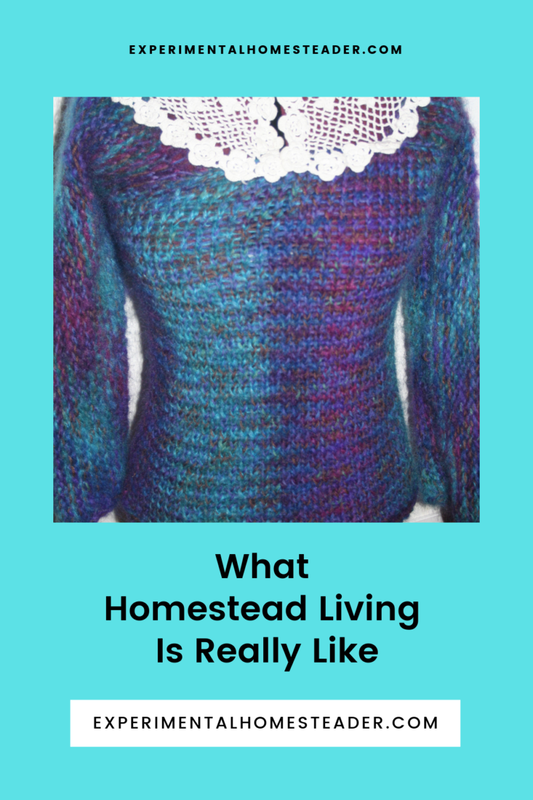 I thought it might be kind of fun since I figured there would be lots of homesteading type activities to see. 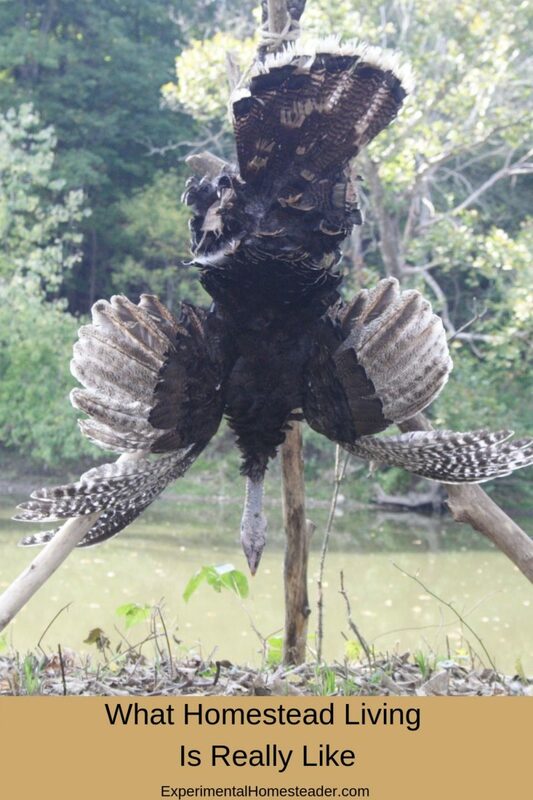 One of the men had butchered a live turkey and had it hanging on a post so the blood could drain out of the turkey. The plan was to cook the turkey over the open fire that night and this was something I was very interested in. Of course, there were also places to buy things you might need on a homestead, such as clothes, fiber and other essential supplies. One of the stores had some raw flax that was not spun into yarn. I bought it with the intention to try to spin it into yarn. Flax is a plant that grows well here so I can grow it and make my own fiber with it if the fiber I bought spins up nicely enough. I also picked up two spools of 100% silk thread. I intend to make some silk lace with it. I have a bobbin lace kit that I have not tried yet and I thought the silk would make a lovely lace collar that I could add to a sweater or other item. Of course, silk worms are something many homesteaders raise for the silk that they can either use or sell. Silk worms eat mulberry leaves – and I certainly could raise them myself however should they escape there would be a lot of defoliated trees on the property so I think it is best to just buy silk thread. Of course, the whole weekend was not about just wandering around the re-enactment and having fun. 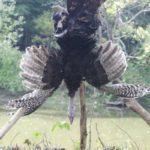 I still had farm chores as well as other things I need to do here on our homestead and when we got home, I had a rather unpleasant surprise to deal with. When we got home from the Mississinewa 1812 reenactment, one of our goats was sick. While I finished unloading the truck,I sent my daughter out to feed the goats. My daughter almost instantly came in screaming that Spice had a huge boil on her face. I immediately ran out to the barn to look for myself with my cordless phone in my hand. Once I saw it, I figured it was Caseous Lymphadenitis (CL) so I made an emergency call to the vet. CL is highly contagious and was one of the problems I was hoping to avoid when I bought goats – but no matter how careful you are sometimes things happen. The vet just happened to be in the office so we loaded Spice into the backend of the truck and took her over for some cultures. Hopefully she will be ok but the vet did confirm it was CL and ordered medicine from Purdue University for me. We currently have her separated from the other goats just in case on the advice of our vet. In addition to the medicine Purdue University is making, I intend to look for some natural cures for CL because I was already told conventional medicine doesn’t wipe CL out completely. Learning to take care of goats for the first time is definitely a learning curve. I put the Peahen Belle in with Spice so she had some company and I figured the CL would not pass from a goat to a peahen. It was definitely an eventful weekend and this is just an example of what homestead living is really like. 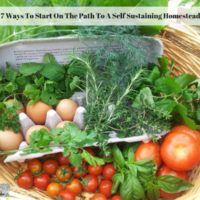 Learn how to start living on a completely self sufficient homestead today with this essential guide plus sign up for our FREE eCourse! 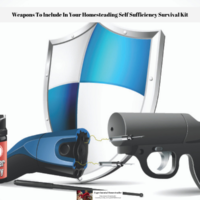 A self sustaining homestead is a lot of work but you do get a lot of satisfaction knowing you are living the self sufficient life you've dreamed of. 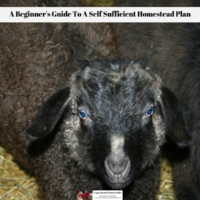 Making a self sufficient homestead plan is the first step to accomplishing your goal of living on a self sufficient homestead. 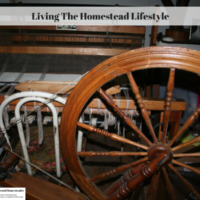 Embarking on the homestead lifestyle is not easy. This is why I love Homegrown and Handmade by Deborah Niemann. The homestead tips are great! 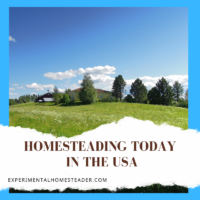 Although the Homestead Act of 1862 is no longer in effect, free land is still available for those wanting to try their hand at homesteading today. 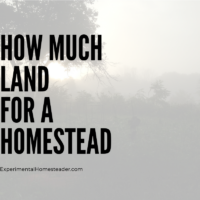 When it comes down to the reality of how much land for a homestead you really need, it's much more than just a number. Learn what you need to consider. 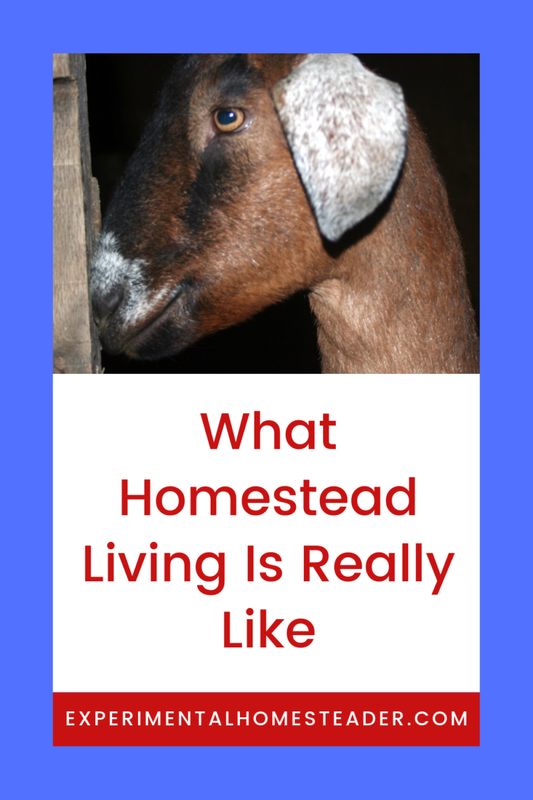 Learn what homesteading living is really like. It's not always picturesque or romantic. In fact, sometimes it is difficult.